Scalability of choice in size/number of production lines in the plant opens up the market for both small and large operators/customers. It is possible to combine different sizes in terms of production line to meet the capacity required (Size 500, 1000, or 5000 litres/hour, + costume made). Swestep also have a mobile plant with a production capacity of 1oo l/hr, allowing it to be suitable for small farms, businesses and refugee camps or on ships at sea. At the moment, research and development are conducted for the feasibility of a large scale plant with production capacity of 12,500 l/hr, which can then be easily scaled up to 25,000 l/hr. Larger plants are tailored and built based on the customers’ needs and requirements. 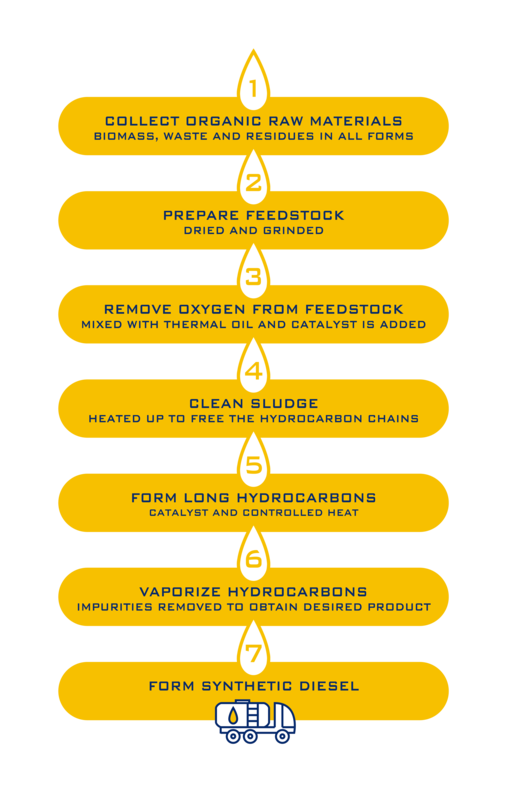 The CPD process (Catalytic Pressureless Depolymerisation) is a liquefaction technology that transforms biomass, organic waste, including plastics, into renewable fuels and sustainable liquids. The core product, when buying a SWESTEP plant today is Renewable Diesel (chemical composition fulfills the European norm DIN E590 for automotive fuels). Results from R&D indicate that the technology, in the future , will be capable of supplying fuel to the whole transport sector (Air, Land, Sea) with renewable fuel alternatives, and sustainable oil/liquids to process to green performance chemicals and additives for the fossil dependent industries. Renewable and circular end products that are formed (from A-Z) in a SWESTEP plant. • Renewable Diesel (EN-590 approved). • Variations of fuels for the Transport Sector. • Variations of liquids for the Chemical Industry. • Variations of liquids and additives for the Fossil Dependent Industry. Sustainable liquids and oil that will be refined in collaboration with the petrochemical industry. The second stage of development is to create performance chemicals for fossil dependent industries such as; Textile, Plastic, Medical and Cosmetic, to mention but a few. As our end products (green fuels and liquids) have an identical chemical molecular structure to the fossil raw materials, our technology presents opportunities to replace and deliver a sustainable alternative to the world’s fossil dependence.